How can you make a return on your investment that is 12,000 times greater than the original asset in less than 10 years, without trading in arms or drugs? Ask Gamal Mubarak, the younger son of deposed President Hosni Mubarak, who was being groomed to become the country’s president before the 2011 revolution put an end to those plans. 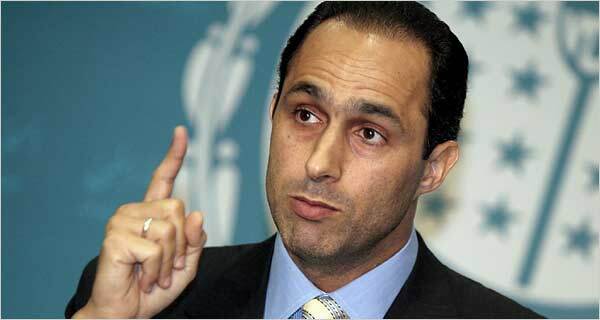 In 2002, the businessman turned politician signed a contract with EFG-Hermes Holding, Egypt’s largest investment bank. Through the contract, which an anonymous source has provided to Mada Masr, he managed to take in a net nontaxable profit of about US$21 million from an initial investment of $1750 in less than a decade. Here is how he did it. In 1997, the Cyprus-based company Bullion, which Gamal Mubarak co-owns, struck an agreement with EFG-Hermes Holding – in which Bullion would hold a 40 percent partnership share – to establish an offshore company called Egypt Fund that would manage EFG-Hermes Holdings’ private equity business. 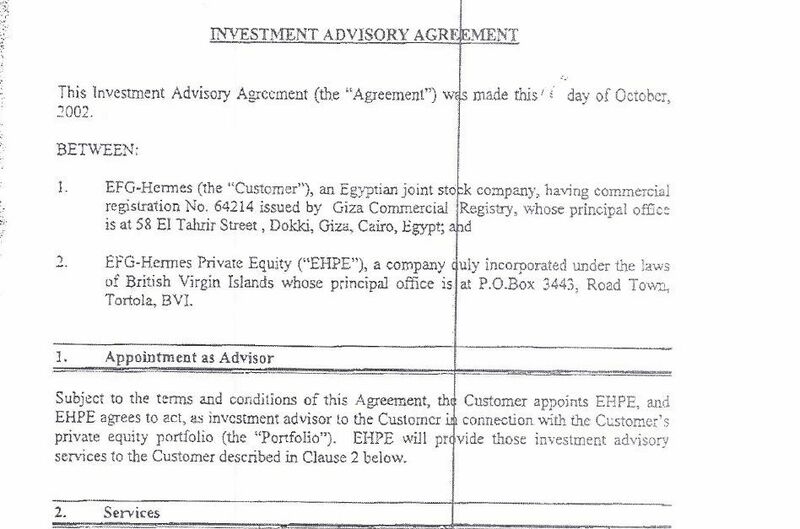 In July 2002, about five years later, Egypt Fund was renamed EFG-Hermes Private Equity (EPHE) and its headquarters was opened on the British Virgin Islands. Bullion now owned a 35-percent stake and Gamal Mubarak was its director. 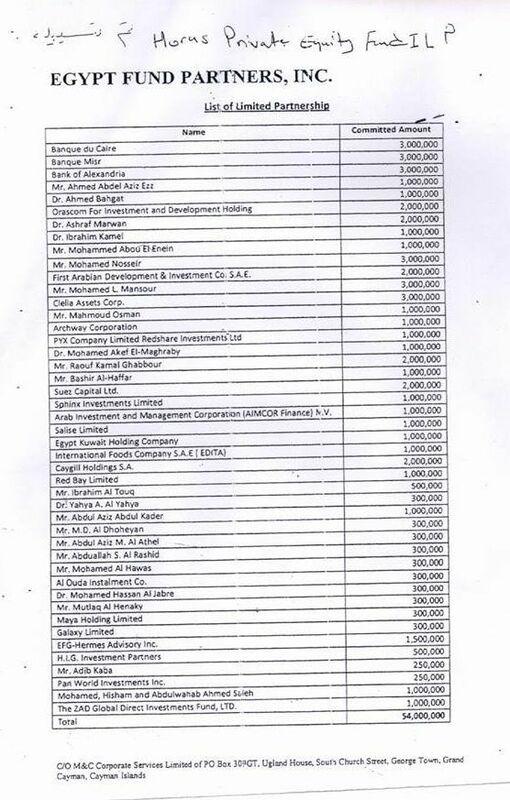 The paid-up capital of the new company was a mere $10,000, of which Gamal’s share was $1750. Over the next decade, Gamal Mubarak’s initial $1750 investment grew to about $20 million in “fees and commissions” through his ownership stake in Bullion. The vast sum was received with Gamal Mubarak barely making any significant investments, taking any risk or providing any real service that added value. Under the terms of the contract, which was signed on October 2002 as an “investment advisory agreement” between EFG-Hermes and EHPE, EFG-Hermes (the real holding company) appointed EHPE (the shell company) as an investment advisor for its private equity portfolio. In other words, the subsidiary that only existed on paper and was without resident experts was intended to give investment advice to the holding company, which housed hundreds of experts. The services described are listed in detail in the contract and include: carrying out regular reviews of the private equity portfolio, recommending and giving general investment advice to the customer in matters concerning the portfolio, coordinating with industry specialists and analysts as well as risk management advisors, preparing a quarterly valuation of the portfolio and proposing minimum sale prices. All of these services would have required manpower, but, in a shell company, there is none to provide these services. The people who provided these services were in actuality employees of the Cairo-based company. While money was paid annually to a company whose existence didn’t extend much beyond a PO box and a mailing address at 3443, Road Town, Tortola, BVI, the holding company was buzzing with 876 employees, according to the company’s website. This kind of agreement has been known to move profits from a tax jurisdiction like Egypt, where the government currently charges corporations a 22.5 percent tax on corporate profits, to a tax jurisdiction like the British Virgin Islands, where the corporate tax rate is 0 percent. The point is to record lower profit by inflating expenses in Egypt and greater profits in the British Virgin Island shell company. One way of inflating expenses is to buy expensive “advisory services” from one of your subsidiaries in a tax haven, which would be recorded as an expense in the holding company’s accounts and reduce its profits on paper, but the money still appears in the holding company’s accounts, because it is still received by a subsidiary. Profits in this case are usually transferred to a fully owned subsidiary. Because shell companies normally have a very small amount of capital invested in them and do not serve any material function, the rate of return on capital investment is usually very high, as the profits are not generated from real activities that require capital expenses. EHPE, with a mere capital of US$10,000 (LE61,500), garnered a net profit of about LE497 million between July 2003 and December 2009. According to the 2002 contract, 10 percent of EFG-Hermes Holding’s capital gains in excess of cost or 2 percent of sale value, whichever was higher, would still be paid to Gamal’s company – in addition to an annual allowance of LE250,000 paid to him for his position on the company’s board. However, it doesn’t make clear economic sense to allow an external party like Gamal Mubarak access to the large artificial rate of return that offshore entities garner, without him having anything to do with the parent company from which the funds were originally transferred. This discrepancy poses questions about the nature of Gamal Mubarak’s relationship with the holding company. EFG-Hermes has repeatedly declined to answer our inquiries about the contract signed by Gamal Mubarak and refused to comment beyond their short 2012 statement on the involvement of the Mubarak family with EFG-Hermes. In the statement, the company said that no member of the Mubarak family held any shares in the EFG-Hermes Holding or its subsidiaries, with the exception of Gamal, who acquired 18 percent of EHPE in 1997, before he entered into political life. Other than Gamal Mubarak’s direct gains as EHPE’s director, the contract seems to have served another purpose, namely to facilitate the movement of money through a lengthy chain of companies that terminates in secret accounts. In 1993, Gamal and Alaa Mubarak started a complex network of secret offshore entities by establishing a company called Panworld Investment in the British Virgin Islands. Three years later, the company made its first known investment as a co-manager of a $9 million fund called International Securities Fund. In 1997, Panworld Investments, along with many of Mubarak’s associates, made a $250,000 investment in Horus I, one of Egypt’s first private equity funds. This was the same year that Mubarak’s Bullion entered into partnership with EFG-Hermes Holding to found what would become the British Virgin Islands-based EHPE. Bullion owned 35 percent of EHPE, with Panworld Investment owning half of this share, 17.5 percent. This means that the profits would leave the holding company in Cairo and travel to the secret jurisdiction of the British Virgin Islands, before traveling back to Cyprus and then returning to the British Virgin Islands: a complex journey attempting to obscure the identity of the politically vulnerable beneficiaries. Although Gamal owns half of Bullion, his name does not appear on official documents because he his stake was brokered through Panworld Investment, the other British Virgin Islands-based shell company. 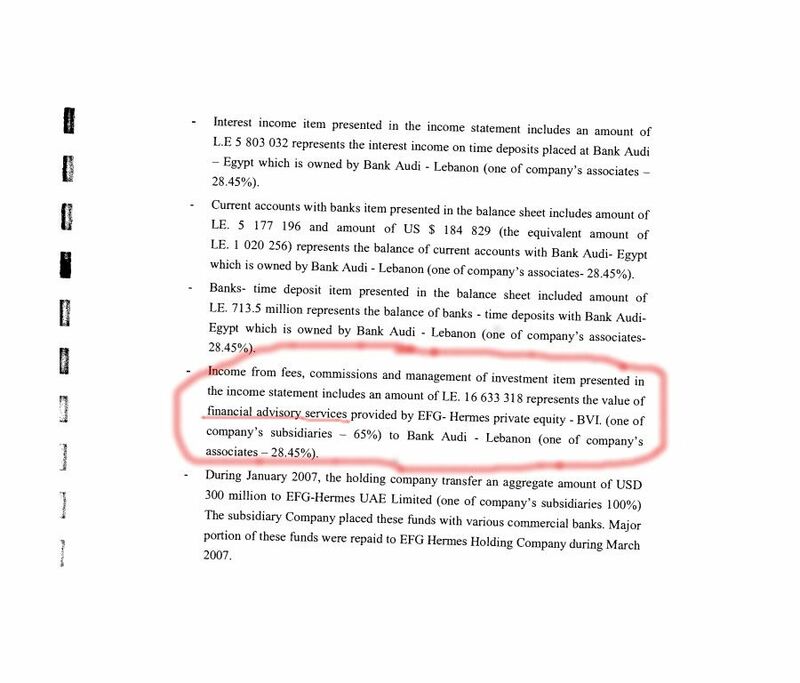 A Central Bank of Egypt report makes reference to US$22.5 million in net profits that were transferred from EHPE’s bank account to Bullion’s Cypriot bank account between 2008 and May 2011. Further, according to a report by a judicial committee appointed by an Egyptian criminal court to investigate an insider trading case in which Gamal is a defendant, Bullion garnered $24.1 million in profit shares from 2007 to 2009, of which Gamal took in around $12.05 million. EFG-Hermes confirmed this information in a previous correspondence, saying that Gamal’s annual profit averaged $880,000 a year. “In the course of his investment in EFG Hermes Private Equity, Mr. Gamal Mubarak received total dividends of $880,000 annually, in the context of which EFG Hermes notes that exchange rates were lower at that time than at present,” reads the 2012 EFG-Hermes statement issued to clarify the Mubarak’s involvement with EFG-Hermes. Additionally, Bullion owned a 40-percent indirect stake in Horus Consultancy, to which EHPE transferred a total sum of LE92.3 million. Gamal Mubarak’s of this sum was LE18.4 million, or around US$3 million, according to the average exchange rate at the time, as well as $1.25 million in compensatory payments for his role as a board member of EHPE. Hazem Shawki, the director of EHPE during the 2011 revolution, said in an official interrogation held at the general prosecutor’s office that Gamal’s shareholder equity in EHPE was LE27 million, approximately US$4.5 million adjusted to the exchange rate at the time, in 2011. This means that, between 2003 and 2011, Gamal made at least $20.8 million, a 1,188,400 percent rate of return on his paid-up capital of $1750. In other words, for every dollar he invested, he took in $11,884 in less than a decade. When looking into the registration location of EHPE, where Gamal Mubarak has an 17.5 percent indirect stake, we find that it was registered in a building called the KPMG Centre, also known as the Tropic Isle building, in the British Virgin Islands. It is an address that the Offshore Leaks database lists as the home for at least dozens of companies. Managing partners of private equity funds are often registered in low tax jurisdictions so that the fees and commissions they receive are exempt from taxes. EHPE was the managing partner of at least eight private equity funds worth collectively close to US$1 billion and received their share of profits made on these investments, of which 18 percent went straight to the Mubarak sons. The judicial committee’s report in the insider trading case affirms that at least LE497 million in profits were shifted to the British Virgin Islands between July 2003 and December 2009. The report also notes that there is no indication that EHPE paid any taxes on these profits. What is more, a similar investment advisory agreement seems to have been signed between EHPE and Bank Audi, in which EFG-Hermes Holding held a 28 percent ownership stake. EFG-Hermes’s 2007 annual report states that Bank Audi transferred more than LE16 million in financial advisory services fees to EHPE, an indication that a similar agreement may have been in place between Bank Audi and EHPE. These agreements have certainly reduced the Cairo-based holding company’s tax bill. “The effective tax rate for 2008 decreased substantially to 10 percent, from 13.1 percent in 2007, as revenues from outside of Egypt and non-taxable entities increased,” reads the 2008 financial statement of EFG-Hermes. How does tax evasion occur? Holding companies typically establish subsidiaries, also known as Special Purpose Entities (SPEs), in tax havens using a mere P.O. 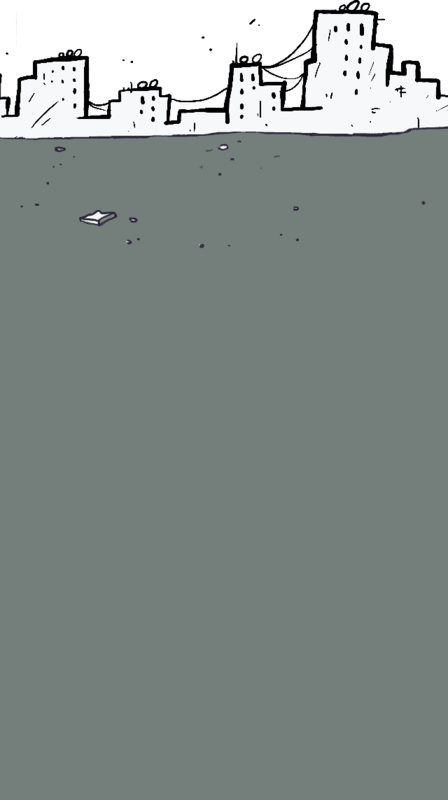 box but without establishing real operations. Companies state that these subsidiaries have been founded for “tax planning” purposes, a euphemism for tax evasion and lax regulation. A “tax haven” is a term used to describe a microstate – typically an island or a group of islands in the Caribbean Sea – in which corporate tax rates are 0 percent and where the ownership of companies can remain unknown. Tax havens have been typically used as destinations to artificially shift profits in order to escape the sovereign tax authority operating in the territory where the corporation actually makes its profits. These islands are so small and house such small populations that they can run their governmental affairs by charging the many large businesses they host very small administrative fees, rather than real taxes. Among the most famous tax havens are the British Virgin Islands, the Cayman Islands, Panama and the Bahamas. Due to the fact that most registered companies have no real operations there, small buildings of no more than four stories can house as many as 20,000 companies. Even president Barack Obama took note of this phenomenon. Special thanks to the Finance Uncovered team for their assistance in producing this story. Data design by Pesha Magid. The Panama Papers: What’s new on Egypt, and why should you care?